The cartellino in the top right corner of this portrait establishes it as having belonged to the famous collector, John Lumley, 1st Baron Lumley (c.1533 – 1609). Lumley amassed one of the greatest art collections outside that of the Royal Court through a combination of inheritance, astute purchases and commissions. He owned paintings of almost all the notable figures of the Tudor dynasty, and his inventory of the collection, also known as the ‘red velvet book’ on account of its binding, and compiled in 1590, still survives today and stands as the single most important document for the study of art in Elizabethan England. Its significance lies not merely in the fact that it is a comprehensive list of the largest private collection of its time, but for the number of paintings to whom artists’ and sitters’ names are given. Dr. & Mrs Bonheim, Cologne, Germany. Lionel Cust, ‘The Lumley Inventories’, Walpole Society, vol. VI, 1917, no.18, pp.15-29. David Piper, ‘The 1590 Lumley Inventory: Hilliard, Segar and the Earl of Essex’, The Burlington Magazine, July 1957, no.7, fig.13, pp.224-229. Mark Evans (ed. ), Art Collecting and Lineage in The Elizabethan Age; The Lumley Inventory and Pedigree: Facsimile and Commentary, 2010, no.164, p.163. Lumley had his paintings inscribed with a trompe l’oeil label as seen here, which usually bore the sitter’s name, their offices and dates, though notably not the artist’s name. This offers an insight into the importance then attached to a sitter’s identity over that of the artist’s. It suggests Lumley was more concerned with collecting a group of portraits of significant historical figures, rather than being concerned by their attribution. This is not surprising when considering how most of the painters at that time were considered no more than artisan guildsmen, and that few actually signed their works. Nor does Lumley seem to have minded if some of these portraits were later replicas, based upon earlier works. A recent dendrochronology of the panel for this portrait reveals an earliest tree-ring date of c.1556, so presumably it must have been painted after 1560. Lumley may have commissioned the painting himself, and certainly it would have been fairly new when he acquired it for his collection. Having left Lord Lumley’s collection, for many years this portrait was assumed to be of Mary I; however, the very closely related drawing by Hans Holbein the Younger in the Royal Collection, Windsor, inscribed as the Marchioness of Dorset clearly establishes that she is indeed Margaret Wotton. Other versions of the portrait are known to exist, and like the present work, are based on a lost original, presumably by Holbein. Three variants of our portrait, all identified as Margaret Wotton, are in the collections at Welbeck Abbey (Duke of Portland), Durnham Massey (National Trust), and the Beecroft Art Gallery, Southend. Margaret Wotton was the daughter of Sir Robert Wotton of Boughton Malherbe, Kent, and the widow of William Medley. She married secondly Thomas Grey, 2nd Marquess of Dorset (1477 – 1530). In 1533 she rode in Anne Boleyn’s coronation procession, and was one of two godmothers for Elizabeth I. 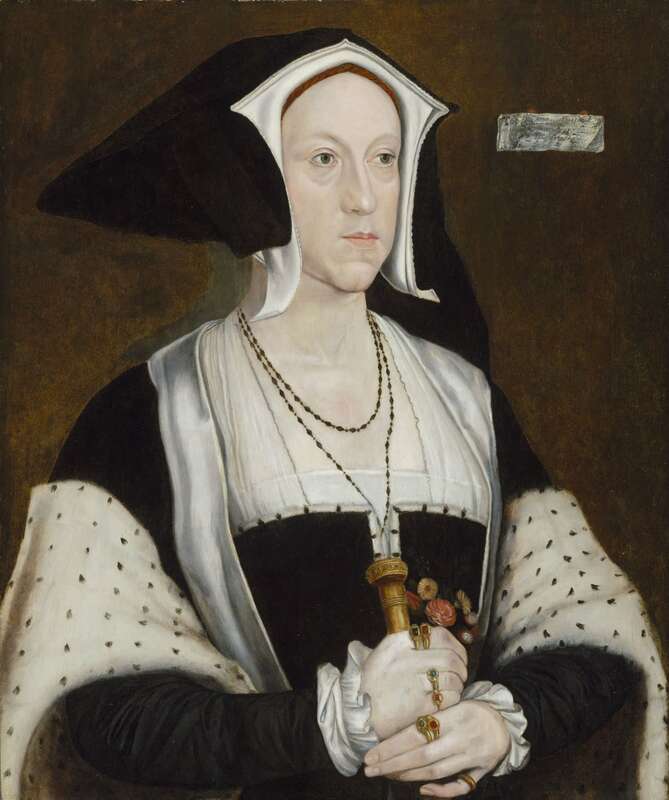 However, by 1534 Margaret was openly engaged in a dispute with her son, Henry Grey, 1st Duke of Suffolk, 3rd Marquess of Dorset (1517 - 1554), a rift that would ruin her reputation. She first quarreled with her son, who had succeeded to the Marquisate in 1530, when he was forced to pay a fine of £4000 for renouncing his betrothal to Katherine Fitzalan, daughter of the Earl of Arundel. As a punishment, she tried to restrict his allowance as he was technically still a minor, only agreeing to his marriage to his preferred choice, Lady Frances Brandon, niece of the King, on the condition that the bride’s father, Charles Brandon, 1st Duke of Suffolk, supported the couple until her son came of age. In 1534 she finally offered to contribute ‘as my small power is and shall be’, but nonetheless Henry brought their dispute before the Kings’ Council, forcing her to admit that his allowance was not ‘meet or sufficient to maintain his estate’, and to offer to increase it. Embittered by the experience, she moved out of the Grey family seat at Bradgate House and died in 1541 at the age of fifty-four. The entry in the inventory reads ‘Of the olde Marquesse of Dorsett, syster to Sir Edw. Wooton’. The collection also included works quite certainly by Holbein’s own hand, including the famous portrait of Christine of Denmark now in the National Gallery (from which the cartellino was removed during cleaning). Another example of a picture from his collection that was painted after the sitter’s death is a portrait from the 1570s of John, 2nd Lord Bray, who died in 1557 (Private collection, England). See Karl Theodore Parker, The Drawings of Hans Holbein in the Collection of His Majesty the King at Windsor Castle, Oxford, 1945, p.43, no.28. (with whom she had four sons and four daughters). Henry Grey was father to Lady Jane Grey (1536/1537 – 1554), whose brief claim to the throne lasted a mere nine days before her summary execution.